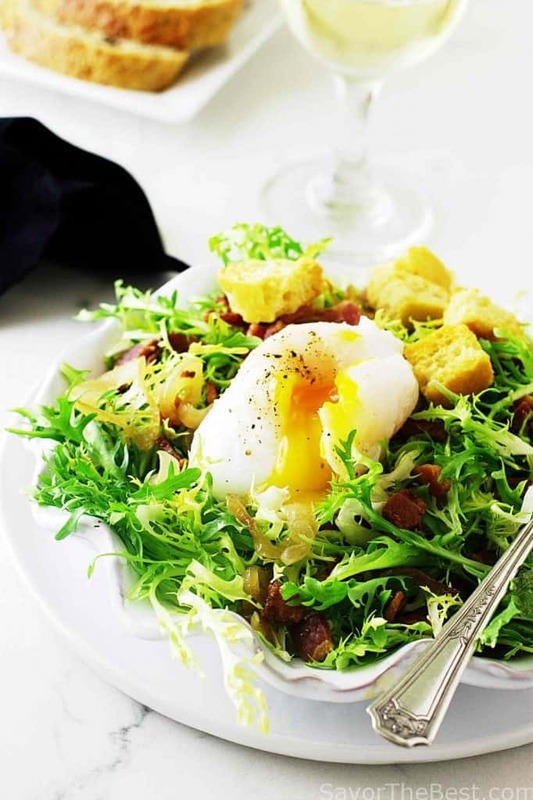 This recipe for Salade Lyonnaise with Poached Duck Egg is a wonderful salad brought to us from the city of Lyons, France. The frizzy, fluffy lettuce by the name of frisée is the star ingredient. The salad combines the slight bitterness of the fresh greens with salty pancetta, caramelized onions, creamy poached egg and garnished with crunchy croutons. 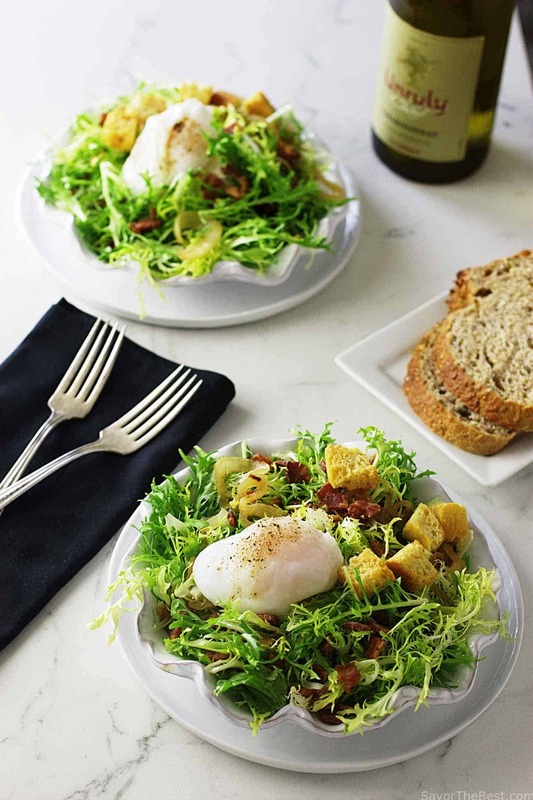 This salad is a French classic of fresh greens, pancetta, onion, fresh duck eggs and it is tossed with a simple sherry vinaigrette. 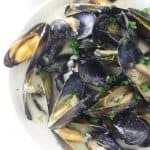 It is a meal in itself, just add a crusty loaf of sourdough bread and a crisp glass of white wine and enjoy! The sherry vinaigrette is made with a mashed anchovy fillet, Dijon mustard and a little honey. 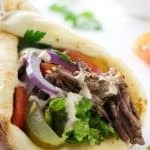 It is all whisked together and compliments the salad beautifully. 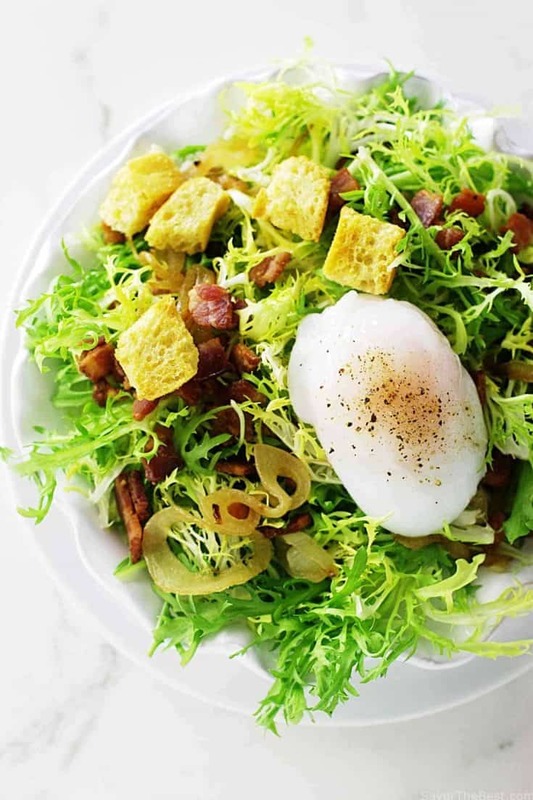 I have been wanting to create this Salade Lyonnaise with Poached Duck Egg for the longest time but the frisée lettuce I wanted to use was not available until recently. I was so excited to see it in the produce and snapped up a head of it. Frisée, is probably the most popular lettuce in France and after enjoying this wonderful salad I understand completely! 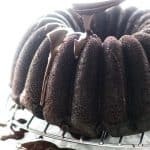 It is tender, crisp and has a slight bitter taste that give it an interesting flavor. 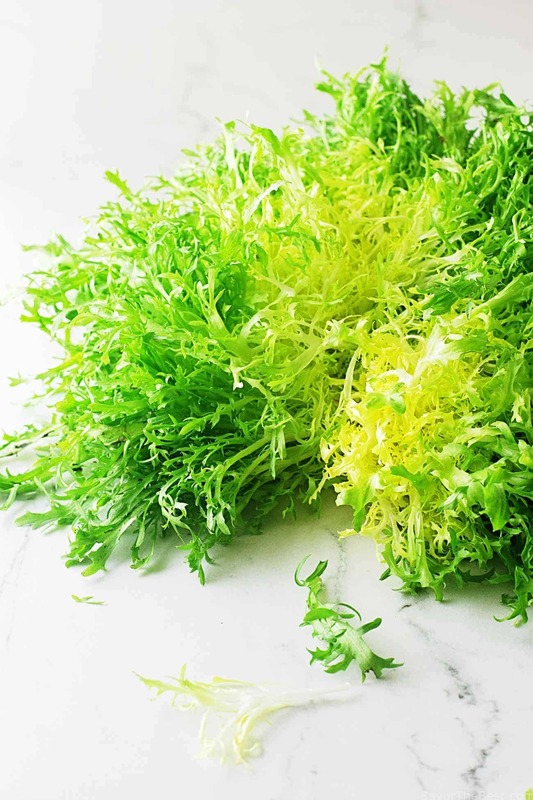 Fluffy frisée is perfect for this salad but chicory, escarole or arugula can also be used. Frisée is usually found in the organic produce section and can be a bit on the pricy side, probably because it takes a little effort to produce this two-toned, frizzy-leaf lettuce. Frisée begins it’s life as a regular endive lettuce plant but as it nears maturity each plant is banded around the middle to prevent the sunlight penetrating to the heart of the plant. When it is untied and opened there is a beautiful two-tone heart with fluffy, tender frizzy spikes. There is a small farm near our home where we buy our weekly supply of chicken eggs and on occasion we will pick up a dozen duck eggs. Chicken eggs are normally used for this salad but the duck eggs are ideal here because the yolks are about twice the size of a regular chicken egg and that creamy yolk is amazing with the crisp slightly bitter greens and the tangy dressing. 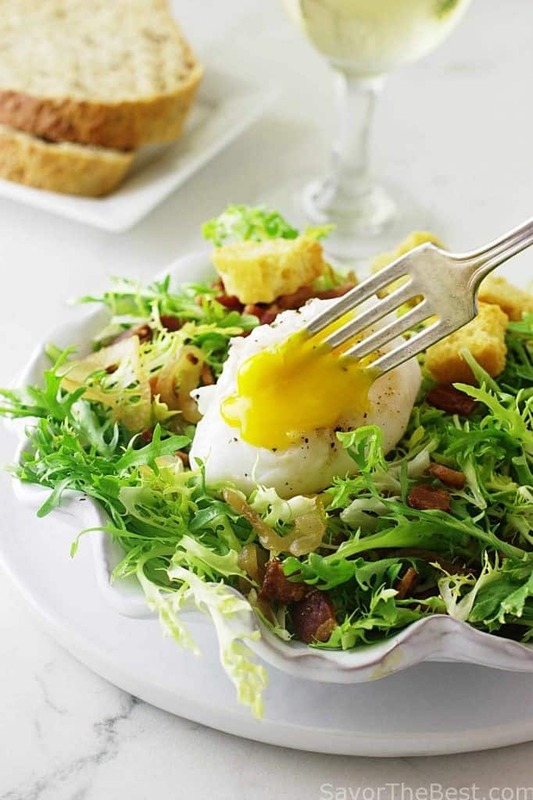 That lovely, warm creamy yolk tastes wonderful in this salad with the sherry vinaigrette. Everyone has their own way of poaching an egg but there is a great video by Serious Eats that describes why poached eggs have that cloudy mess in the water and how to correct it. Several years ago I watched a video with an egg being cracked into a ladle and the ladle held on top of the simmering water for 30 seconds which lets the white part begin to set, then it is tipped into the water. It’s a great technique and makes poaching an egg so easy. If more than one egg needs to be cooked I break the eggs into small plastic containers that have been sprayed with oil. They are floated on the water for a few seconds before being tipped into the water. Did you know that you can also poach eggs in advance and then reheat them? All you do is poach them, remove them from the poaching water and place them in icy water to stop their cooking process. When ready to serve just add the eggs to hot water (from the fawcet) and allow them to warm for about 5 minutes. It works! 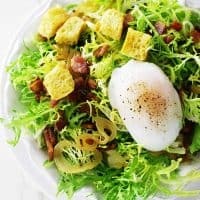 This salad combines the slight bitterness of the fresh greens with salty pancetta, creamy egg yolk, caramelized onions and croutons. The salad is finished with a simple sherry vinaigrette with anchovy and Dijon mustard. Adjust the heat to medium-low and add the olive oil to the skillet and when it is warm add the onion. Cook the onion, stirring often, until tender and caramelized about 15-20 minutes. Remove from the skillet and add to the paper-towel lined plate with the pancetta. Fill a large saucepan three-quarters full of water. Bring the water to a boil, reduce the heat to simmer. Working with one egg at a time crack it into a fine mesh strainer, swirl it around allowing the watery white to drain off, transfer the egg into a small half-cup plastic cup or a ladle that has been sprayed with cooking spray. I use the individual serving containers that applesauce are sold in. Do the same process with the second egg. 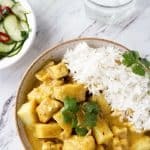 Float the containers on top of the hot simmering water for 30 seconds, or if your using a ladle then hold it only slightly submerged, then gently tip the egg out of the container and into the simmering water. Cook an additional 2-3 minutes, or according to your preference. While the eggs are poaching, add the frisée to a large bowl and toss with 1/2 of the vinaigrette. Reserve the remainder for another salad. Divide the salad equally between two chilled salad plates and distribute the pancetta and onions over the top. 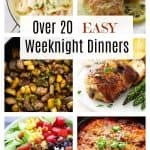 With a slotted spoon, scoop one egg from the water and blot the bottom of the spoon with a kitchen towel to remove any excess water, arrange the poached egg on one of the salads and proceed with plating the second egg. 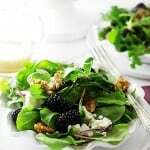 Add croutons to each salad and serve immediately. This salad is fantastic! Definitely brings egg and bacon to a whole new level. What gorgeous shots you got here. Love the combinations of eggs with Greens – anyday. Ooh love the creamy egg yolk! 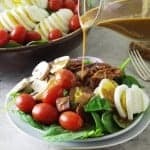 Never tried duck eggs before but this salad makes me want to try them! Thanks, Heather! That creamy egg yolk pairs so well with the crisp, slightly bitterness of the frisee greens and of course the saltiness of the pancetta. Wow what an interesting read about how frisée lettuce is grown. Not sure I can get any here but now I’m determined to find out! In the meantime arugula would be just as delicious. Can’t wait to try! That is a picture fit for framing. Beautiful and very appetizing! That looks like the one from the star restaurants! I love everything about this salad..from that gorgeous frisée to the duck egg..absolutely divine!